The British summer has been rained off so far, but these umbrellas by Ella Doran will remind you of sunnier days. They’re available from the Dezeen Super Store at 38 Monmouth Street, London WC2, so come down to the launch party on Thursday 12th July and print off this flyer for 10% off any product in store! 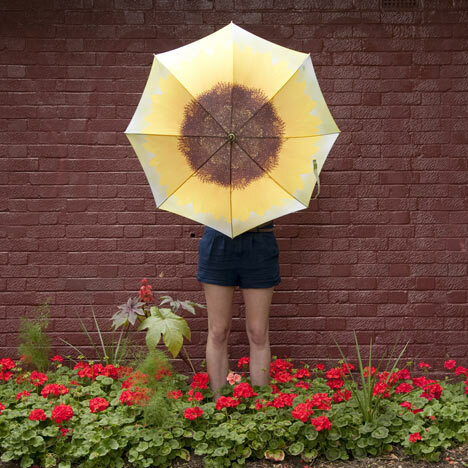 These two designs are called Sunflower and Sunlight Through Leaves, and we've got more Ella Doran umbrellas arriving soon. Dezeen readers can get 10% off any purchase (excluding sale stock and Jambox) and enter our competition to win a designer watch worth £150 by downloading this flyer and presenting it at the store. The store's official launch party is happening tomorrow, Thursday 12th July, but if you can’t make it the shop is open until 30 September! Dezeen Super Store is now open!